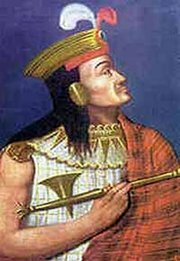 Atahualpa (c. 1502 – 1533) was the 13th and last Inca of Tahuantinsuyu, or Inca empire, who defeated his older half-brother Huascar in a civil war sparked by his father Inca Huayna Capac succumbing to smallpox. Backed by strong generals and a large army, Atahualpa was able to defeat Huascar after many years of brutal battles. On his way back to Cusco to claim his recently won throne, Atahualpa stopped in the Andean city of Cajamarca with his army of over 80,000 troops. It was here that Atahualpa was betrayed and The Ransom Room|captured on November 16th, 1532 by Conquistador Francisco Pizarro. Pizarro and his men prepared a surprise attack which would take place in the main square of Cajamarca, where Atahualpa was ultimately executed at the so-called ransom room. When Atahualpa arrived at the square in Cajamarca to dine with Pizarro, he arrived in full regalia and brought only a small contingent of honor guards. They were met by the friar Vicente de Valverde. Through a translator, Valverde delivered the "Requirement," indicating that Atahualpa and his people must convert to Christianity, and if he refused he would be considered an enemy of the Church and of Spain. According to Spanish law, Atahualpa’s refusal of the "Requirement" allowed the Spanish to officially declare war on the Inca people. Accounts by the Spanish conquistadors indicate that Atahualpa was offered a bible which he threw to the ground. Over six thousand Inca soldiers were killed over the course of two hours, and the Spanish imprisoned Atahualpa in the Temple of the Sun. In exchange for his release, Atahualpa agreed to fill a large room with gold and promised the Spanish twice that amount in silver. Stunned by the offer, Pizarro nonetheless had no intention of releasing the Inca because he needed the ruler�s influence over the native people to maintain order in the surrounding country. Still outnumbered and fearing an imminent attack from the Inca general Rumiñavi, the Spanish saw Atahualpa as too much of a liability and chose to have him executed. Pizarro staged a mock trial and found Atahualpa guilty of revolting against the Spanish, practicing idolatry and murdering Huascar, his own brother. Atahualpa was sentenced to execution by burning. He was horified, since the Inca believed that the soul should live, and not be burned. Soon after, Atahualpa realized of the Spaniards greed and offered Pizarro to buy his liberty by filling the room where he was kept prisoner with gold and the two following rooms with silver, up to the level of the reach of his arm. Friar Vicente de Valverde, whom before had offered the bible to Atahualpa, intervened again, telling Atahualpa that if he agreed to convert to Christianity he would convince the rest to commute the sentence. Atahualpa agreed to be baptized under Christian faith and, in the end, was strangled instead of being burned. Atahualpa died on August 29, 1533. Atahualpa was succeeded by his brother, the puppet Inca Tupac Huallpa, and later by another brother Manco Inca Yupanqui. This article is based on the article Atahualpa from the free encyclopaedia Wikipedia and stands under the GNU-Licence for free documentation. In the Wikipedia a list of the authors is available.